In a oven, cook sausage, ground beef, onion, and garlic over medium heat until well browned. Stir in crushed tomatoes, tomato paste, tomato sauce, and water. Season with sugar, basil, fennel seeds, Italian seasoning, 1 tablespoon salt, pepper, and 2 tablespoons parsley. Simmer, covered, for about 1 1/2 hours, stirring occasionally. 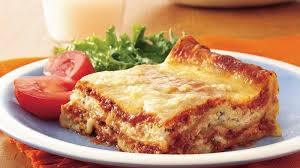 This entry was posted in Food and tagged best lasagna, home cook, home made, italian, original italian, original recipe, recipe by Miss P. Bookmark the permalink.